Brand new airport security technology arriving at Southampton! Posted on 15th December 2016 at 12:30 pm. Home » News » Brand new airport security technology arriving at Southampton! Southampton Airport will soon be able to boast new state-of-the-art body scanning airport security technology in a timely reply to the new regulations set out but the Department for Transport. 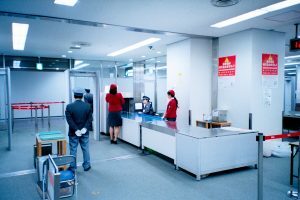 As of December 12th, the brand new security scanners, commonly known as body scanners, have the ability to identify a huge number of various threats to security. Potential threats can be identified in as little as a few seconds in order to maximise passenger security. The new facilities will be used as well as the existing security measures and screening systems. This specific model of scanning created by Rohde and Schwartz draws on millimetre wave technology at an output several times lower than that of a mobile phone. The scanners will produce a mannequin-like image in order to highlight any areas which may require staff to take further inspection of. Southampton Airport will be the 4th UK airport to install this specific technology. Simon Young, security operations manager at the airport, said: “The technology employed by the security scanner is designed in such a way that it maintains the privacy of the passenger whilst also ensuring the safety and security of the airport, something which is paramount to us. Southampton saw 1.8 million passengers pass through their facilities in 2015 and boasts being the 18th busiest airport in the UK with its top domestic and international destinations being Edinburgh and Amsterdam. In September, the airport reported its busiest month on record, therefore with a forecasted rise in passenger numbers then it looks like the new security could be coming just at a perfect time to deal with the increase.